The salaries of TV's highest-paid actors have been revealed. Split into three categories – comedy, unscripted and drama – the new report comes from Variety and reveals just how much stars earn per episode. The highest-paid actor in a US drama is Javier Bardem who will earn $1.2m for his role in a forthcoming Amazon series based on “legendary conqueror” Hernan Cortes from writer Steven Zaillian. 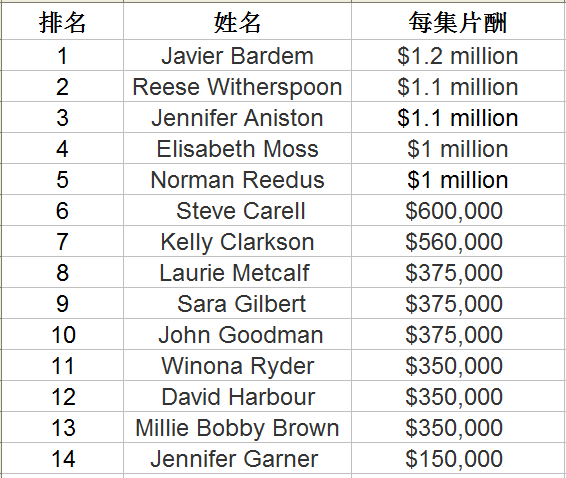 Following close behind are Hollywood stars Reese Witherspoon and Jennifer Aniston who'll each earn $1.1m per episode for their roles in a new series from Apple. Their co-star, Steve Carell, will see him score $600,000. Elisabeth Moss is revealed to net $1m per episode for her lead role in The Handmaid's Tale as well as Norman Reedus who'll earn that same amount after succeeding Andrew Lincoln as the lead star of The Walking Dead. Winona Ryder, David Harbour and Millie Bobby Brown lead the Stranger Things charge with $350,000. Laurie Metcalf and Sara Gilbert earn the same as their co-star John Goodman in Roseanne spin-off The Conners ($375,000) while Jennifer Garner is earning $150,000 per episode for her lead role in HBO’s Camping. In the unscripted department, Kelly Clarkson earns $14m per season for her judging role on The Voice ($560,000 per episode) with the cast of Queer Eye making just $7,500 despite it being one of Netflix’s most acclaimed shows of the year.